I found this at a fun store to visit, Second Use, where I like to check for recycled materials to use in my woodworking. Kind of my thing, which should be interesting as I move into more furniture type things. I did see a bunch of Poplar that might be good for a project I’m considering. Any way, I saw the vise pictured to the right on the site, and went down to take a look. It is a bit rusty on the surface, but it’s still usable, and it’s massive! 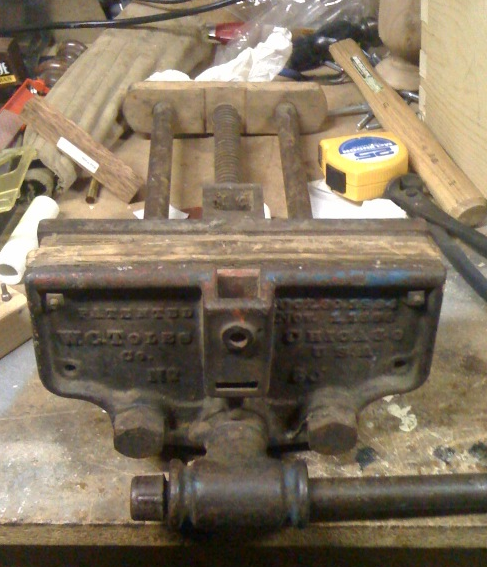 It cost me $45 at that size, and condition for a quick release vise I think that’s about fair. A little elbow grease, a wire brush and some WD-40 should be good. As for the bench this goes on, it’s a bit of a struggle right now. I’m having lots of problems figuring out what I want out of a bench, at what I can afford to pay. I want it solid, a thick top, a good height for hand tool wood working, and able to hold work well in lots of ways. I’ve been reading Chris Scwarz’s book on Workbenches, and it’s full of good ideas. Too many good ideas. It’s somewhat maddening because I want to narrow it down, not expand the list. I’m actually coming close to a final idea, only just recently, from the book mentioned above. The “roubo” which is oft mentioned on the internet, in the woodworking forums, etc. However, it’s got a lot of what I want, plus it’s compatible with what I already have. I have a base pretty much built already in another bench that came with the house. It’s got solid 4×4’s for legs, and is a good layout size, it’s too high but some sawing will fix that. It really just needs a good top, and some hardware. Which brings us back to the vise. 🙂 See what I did there? I heartily recommend the book, and the author for reading. They have a good blog and magazine for us woodworkers.